Domestic and foreign retailers have trended to cooperate with small and medium enterprises (SMEs) to diversify their products and head toward export. In mid-June this year, Lotte Mart exported its first consignment to Myanmar with over 100 products under the supermarket’s Choice L brand, produced by Vietnamese SMEs. According to plan, Lotte Mart will continue exporting to China and Indonesia. Mr. Yoon Byung Soo, director of Lotte Mart Vietnam’s product strategy division, said that last year Lotte Mart Group imported Vietnamese goods worth VND1.3 trillion to provide supermarkets in some Southeast Asian nations. This year, the value of is expected to approximate VND2 trillion ($57.2 milion). The group will speed up purchase of banana, mango, dragon fruits and products for daily use with outstanding quality and reasonable prices. 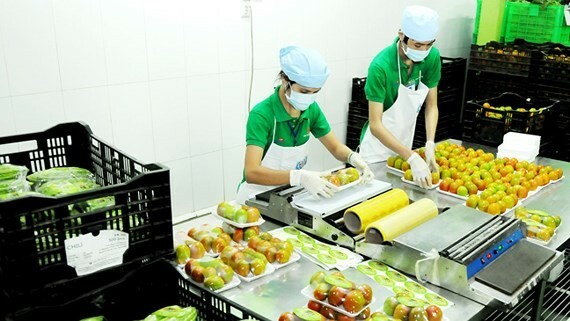 This year, Big C Vietnam has established a division in charge of SMEs assistance and development through program ‘Siding with Vietnamese brand names’ to diversify products on shelves of Central Group Vietnam. Director general of the group and Big C Vietnam Phillippe Broianigo said that after a period of implementation, the program has been attended by many SMEs and gained positive changes. At present, products of many SMEs have been shelved at Big C supermarkets. Right after buying Metro Cash&Carry, Thai Berli Jucker Group has applied the priority policy to choose producers who have not had brand names in the market, cooperate with them to develop private brands for the supermarket. Products will be in the two sides’ names. The supermarket will supervise production phase and provide advices to improve production process and packaging design. Domestic supermarket system Saigon Co.op has been seeking qualified producers to work with them to develop products under Co.op Mart brands. For the last recent years, Saigon Co.op has cooperated with Singapore’s leading retailer NTUC FairPrice to choose products to develop Co.op Mart brands for export to Singapore. At a forum themed ‘the story of brand names’ hosted by Big C recently, Mr. Nguyen Xuan Ton, owner of Long Trieu Coffee Company in Lam Dong province, said that building brand name for SMEs like the company was very difficult. For a long time, customers did not know the company’s products. So he had decided to join hands with Big C to develop Long Trieu brand name. In fact, not all SMEs attending supply chains can keep their brand names like Long Trieu. Most have produced goods for distributors’ brands. There are some controversial opinions saying that producers will lose themselves if keeping making goods for distributors. In response, a business making goods for a supermarket said that it was an initial success for it to be chosen by the supermarket to attend in the supply chain. That helped the company learn about operation way of a retailer and the market. They were usually short of these knowledge for just focusing on production. According to some businesess, producers must thoroughly know about legal conditions when negotiating to cooperate with distributors. For instance, product quality certificates and food hygiene and safety licenses of industrial foodstuffs belong to the producers not retailers. Ms. Nguyen Phi Van, international franchise consultant, said that amid expanding global integration, the survival of businesses especially SMEs much depend on their visions. They need to broaden visions to international markets to survive, develop sustainably and strongly in the domestic market.